The Nick Jr. PAW Patrol Activity Desk with Paper Roll from Delta Children gives budding artists plenty of inspiration. 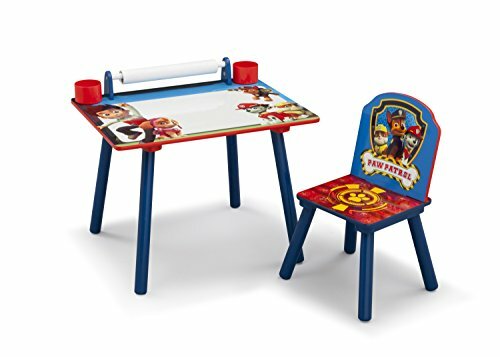 Featuring a spacious tabletop with dry-erase surface and paper roll printed with ready to color PAW Patrol images, this desk and chair set is the perfect gift for any PAW fan. Plus, built-in storage for art supplies keeps everything contained in one convenient spot. About PAW Patrol: PAW Patrol is a CG, action-adventure preschool series starring a pack of six heroic puppies: Chase, Marshall, Rocky, Zuma, Rubble, and Skye, who are led by a tech-savvy 10-year-old boy named Ryder. With a unique blend of problem-solving skills, cool vehicles and lots of cute doggy humor, the PAW Patrol works together on high-stakes rescue missions to protect the Adventure Bay community. From Marshall the firedog to Chase the police pup to Skye, who flies high in her copter, each pup brings unique personality and skill to the team, modeling the importance of teamwork and good citizenship. They all have special Pup Packs on their backs to help them handle anything - from rescuing kittens to saving a train from a rockslide! No matter how big the adventure, the PAW Patrol always has time for a game, a laugh, and an ear scratch from Ryder. WHAT'S INCLUDED: One (1) desk, one (1) chair, 16' paper roll with ready to color images. AGE RANGE: Recommended for ages 3+. WEIGHT LIMIT: Chair holds up to 50 lbs.